I might just be lazy, but do you ever find it tiresome to select all the source code from a large post on Stack Overflow to copy it? Do you guys have a better way of copying large source posts? I'm using Firefox 3.5.5 on Windows 7. I don't know why people would be against this small piece of added functionality. It makes sense to have a copy button. I certainly don't expect this comfort control to take priority but an official word on whether it will be considered would be nice. I have learned that this functionality simply will not be implemented due to security concerns. An alternative that I would not mind having would be an "Email me teh codez" button. One click, done! Now I have a somewhat permanent record of the code which I can organize in mail folders and copy at any time. Simple and unobtrusive. ZeroClipboard and sytaxhighlighter both seem to do a nice job of abstracting the actual "copy to clipboard" code. There are some cases in which all the code is in one line and is very long like answers to this post. These lines are hard to copy, and it would be nice to have a Copy code button. Code snippets don't have to be 1000+ lines to create a vertical scrollbar. Worse still are code snippets on one long line with a horizontal scrollbar. Those are a real pain to copy. How can anything that makes things a little easier be a bad thing? Today, it should be fairly simple to implement in jQuery. SE already uses jQeury anyway. I think it's worth looking into. SO shouldn't be a snippet site, but it is devoted to helping coders share knowledge. Such a feature facilitates that transaction. I can't understand why people would object to taking one single click (to select all and copy) instead of many steps (as Shog9 suggested). And w.r.t. Ether's answer, I don't think it matters how many lines of code you want to copy. I'd say it's particularly painful if there are only a few lines. I've run into many sites with "copy code" button. phpBB has Select All. I implemented a Chrome extension which solves all these problems. Install the extension from chrome store or read the product page. The app is open source, see the repository. Feel free to report issues or improvement ideas. H.B. on StackApps has written a script to do exactly this. A user-installable script lets anyone who wants this feature have it without running afoul of any of the objections raised in other answers. See also this question for some further discussion of similar tools. I really would like this feature, and it would make it easy to test out code. If there is so much source code in a question that it is onerous to copy it, and especially that you feel a need to paste it all in your response, then both the questioner and you the answerer are doing things wrong. There is rarely a need for a huge amount of source, and you shouldn't have to repeat it in your response. If you do, I figure you deserve to go through a few extra steps to do so. It's not something we want to encourage. One alternative that would take care of both of them: override codeblock behaviour to select-all text within that codeblock when double-clicked. This way, there is no additional button to be ethically unpleasant; and since you have to press CTRL+C manually, it is not a security concern. If all those "selecting" and "clipboard" functions are not possible/secure, then what about a simple link to the raw content, just like GitHub does? The "raw" button links to a new page that contains the code snippet as plain text. This allows to save or copy/paste it easily. I struggle with the same thing so I decided to create a browser extension that adds a copy to clipboard button on every code snippet. 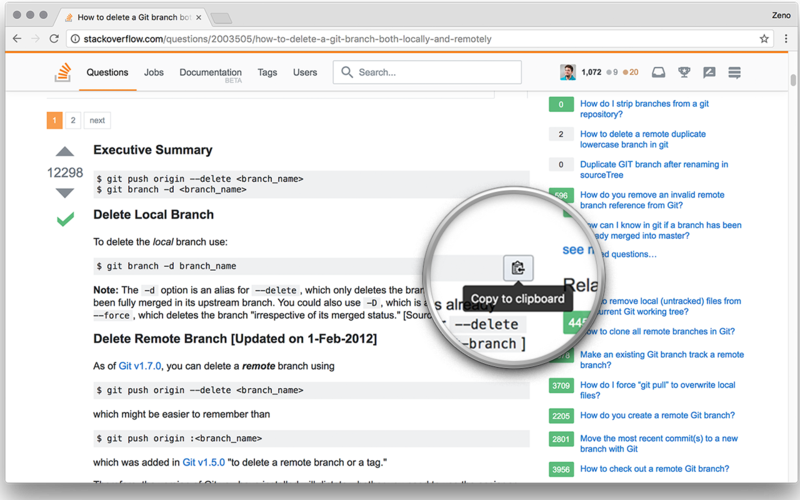 It works with all StackExchange sites, including StackOverflow. If you're interested, you can use it on Chrome or Firefox. Actually, I've created a chrome extension to solve exactly this problem. You can try it here. Basically, whenever you double click a code snippet, it's automatically copied to your clipboard. Considering all of the source code is wrapped around a <pre><code> block, I suspect it would be easy enough to write a Greasemonkey snippet to find those code blocks and copy them to the clipboard for you. Or similarly, I've been using EverNote as of late and I've found that highlighting the code in a question/answer and then hitting CTRL+ALT+V will grab the selected text and put in into a new note entry for me. Then I can easily take it where I need it. The Stack Overflow Extras (SOX) userscript includes this feature, along with loads of other useful enhancements. The setting is called "Add a button to code in posts to let you copy it". Just click the button to save the code to your clipboard. You'll need to install Tampermonkey (Chrome, Microsoft Edge, Safari, Opera Next, and Firefox) or Greasemonkey (Firefox) first (see above link for details). This type of integration has been proposed for TeX SX, and with the recent integration of CircuitLabs into Electronics SX, it seems like there are some precedents (and models) for how this could work. If you are struggling to select all of the code in a question/answer then the correct action is to EDIT THE POST to remove the extraneous code. There should never be so much code in a post as to pose a useability problem. Adding auto-copy functionality will promote behemothic walls of crappy code that we simply do not want. Do you guys have a better way of copying large source posts? The code block number can be specified in square brackets in an XPath expression. For me I find this more useful than a "Copy" button. Here are examples of a one-liner in action for Why is it faster to process a sorted array than an unsorted array?. Nah. Jeff specifically said somewhere on his blog that SO was not for posting "huge swathes of code." And how. The other part is 2: when you paste it somewhere, annoying line numbers don't spill into your code which so far, doesn't happen. I'd say SO has got codeblocks right, and they shouldn't be touched. I'd shudder if they ever look like the code blocks here. I've always hated the "copy" button on sites that sites have, mostly for the reason if you can write to my clipboard, you also read it. And people don't usually like that. See the need for Flash to do this. Do you guys have better way of copying large source post? Edit -> Select all -> Copy -> Paste -> Edit out non-source portions. Why isn't there a “copy code” option in the code samples block? How to easily copy, download, or view all of “code box” in question? 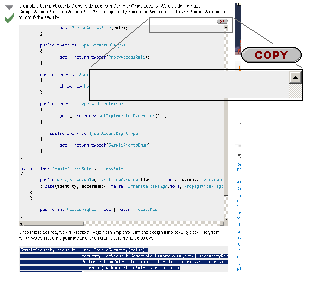 What if there's a “copy” button near the code area? Is it possible to add a function (button) to select a complete code block in a question? Can this be added to Stack Overflow? Should I be discouraged by Stack Overflow?